Back in June we told you to hold off on applying for three cards as they would get better in July. One of those cards is the BMO AIR MILES Mastercard. This is the no annual fee version that for sometime now has had a sign up bonus of 500 AIR MILES. That bonus continues with the newest acquisition offer but on top of that they will offer you 3x miles on all purchases for the first six months. This means you'll earn 3 AIR MILES for every $20 you spend on the card. This is the strongest earn ever seen on an AIR MILES card regardless of whether it is a no fee card or the higher annual fee premium cards! 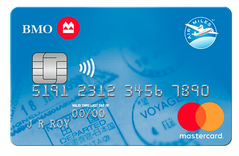 If you are an AIR MILES collector this is something you'll want to look at even if it just having the card for those 6 months as it costs you nothing as it is a no annual fee card.